Chuck Testa, a salty, bearded taxidermist in Ojai, Calif., almost assuredly has a national audience now, thanks to his ridiculously catchy commercials. Created as a local ad campaign by the Commercial Kings, a reality show that specializes in viral commercials for local businesses, the videos tout his skills, proclaim things like, "You probably thought this deer was alive... Nope, it's just Chuck Testa with another realistic mount." His signature, long-winded "Nooooope" became a veritable catchphrase, with the jean-shorts-sporting taxidermist appearing alongside pictures of the historically deceased as if they were alive: "Tupac Back? Nope! 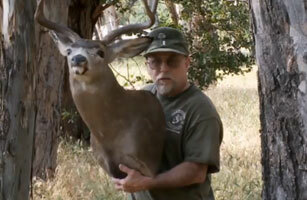 Just Chuck Testa." His simple utterance has even spawned additional viral hits, like a spoof of MC Hammer's "Can't Touch This."